Trust me when I tell you that I love pakodas. In any form and in all versions. Actually to my thinking, there are couple of different names that we call these deep fried delights. My passion for these never really stopped and each one comes with its own memory and every single time I think about it, I get reminded of those many times down the memory lane that I can walk down. I am sure its the same for all. Come rain and the only dish one would want to rush in to make are pakodas. We have had our share of rains and pakodas. Not exactly in the same order, as sometimes I simply forget to make these, admiring the rain lashing away. Other times, just thinking of rains, makes the heart go fonder and in memory I make these. Coming to the types that I was talking about, there is that Bajji that I refer to those where the batter is thin and you dip the cut vegetables and deep fry. 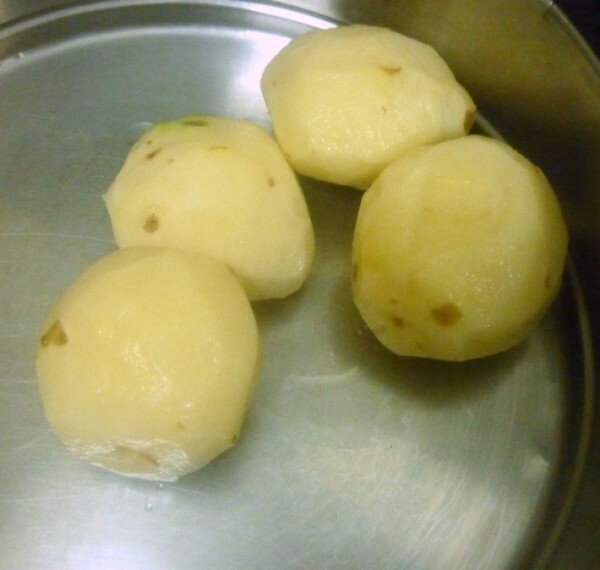 The round gol gol version where potato masala is normally dipped into thin batter is called as Bonda. And the other thick crispy fritters are what I refer as Pakoras / Pakodas. All these can be made with Plantain, Potato, Onions, and just about any vegetable. The main ingredient or the base is usually Besan/ Chickpea flour. We also make with Maida, Rice flour and a mix of various other flours as well. I then realised that most folks refer the regular Vazhakai / Onion bajji types made with potato as Pakodas as well. There is this other almost dry version of pakodas, where lentils are used. 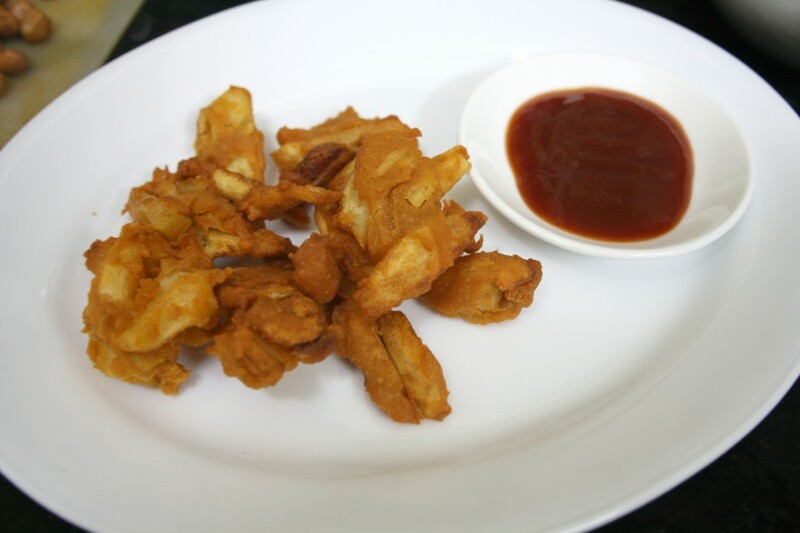 Anyway all this talk about pakodas remind me that we are entering into our third week of Blogging Marathon and I decided to do a Pakora Masti! While thinking about what theme to make that might get me excited, something hit me hard that, there is nothing more exciting to me, than a tempting crispy pakodas. So in lieu of that I thought I would ask everybody to fry some pakoras, albeit it being that thick crispy version and not the bajji types. Wash and peel the skin. Slice into 1″ thick juliennes. 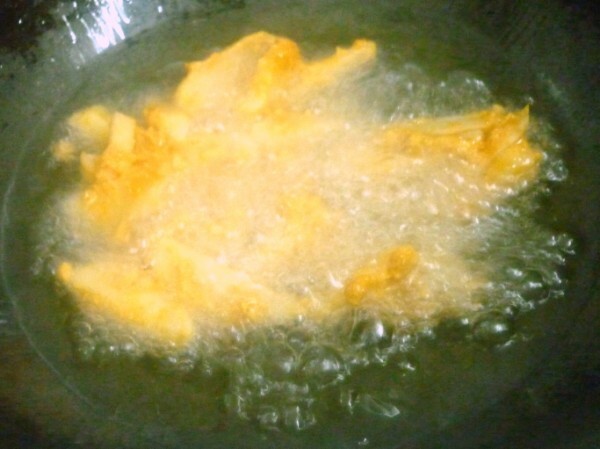 Soak in water till you are ready to fry. Once the oil is on the flame, drain the potatoes over a colander. Take these chopped potatoes in a bowl. dust the flour over it. 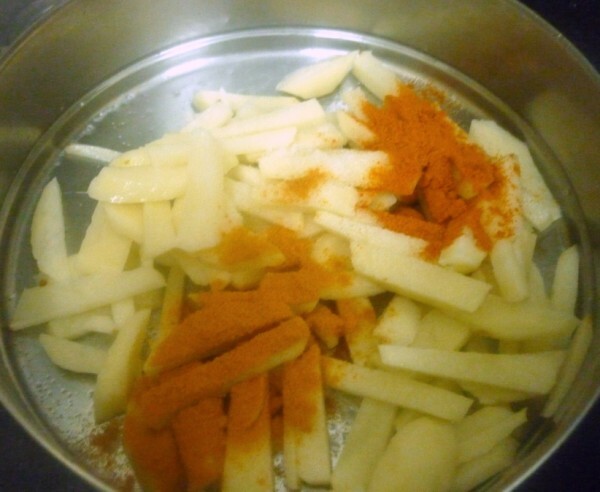 Add the salt, sambar powder, red chili powder. Normally the water that’s still there is enough to get the flour sticking to the potatoes. Else just sprinkle some water and make sure the potatoes have a good coating of the flour. When the entire batch is mixed well, roughly chop or mash it down, so that you end up with somewhat broken uneven shaped fingers. You don’t have to make sure you have french fries here. Once the oil is hot enough, lower the flame to almost medium. Gently drop down the aloo mix and wait for it to come up. Turn over the other side and make sure the pakoras turn golden. Drain using a spatula and remove to a kitchen towel. The sambar powder gave a different taste to these pakodas. And these disappeared in no time and kids wanted more. The cyclone and the rains simply added more reasons for me to make couple of more batches. 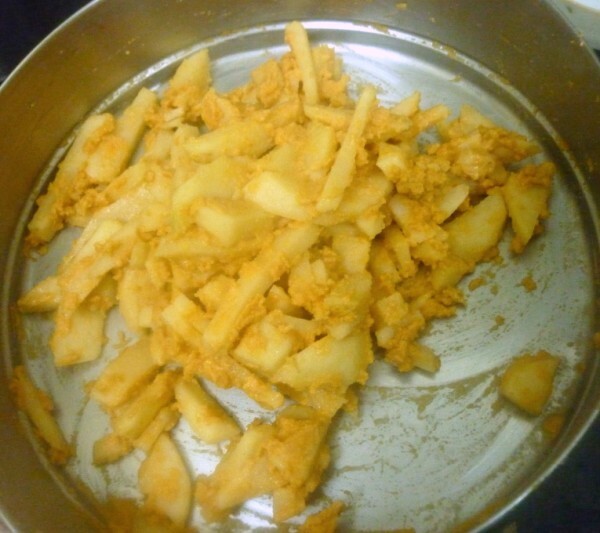 Have never done pakodas with potatoes… interesting!!! we do potato bajji or onion pakoda!!! Perfect and spicy tea time snack,love this.. These would disappear in no time at all, Valli…. Awww…they are the best things to be devoured on a rainy day. Lovely share. Wish i get a plate of this crispy,tempting and delicious pakodas, its too cool here wish i get a plate of this hot pakodas now. No wonder these disappeared fast. Looks so tempting Srivalli.Never tried potato pakoda and now my lil one wants these right now!!! 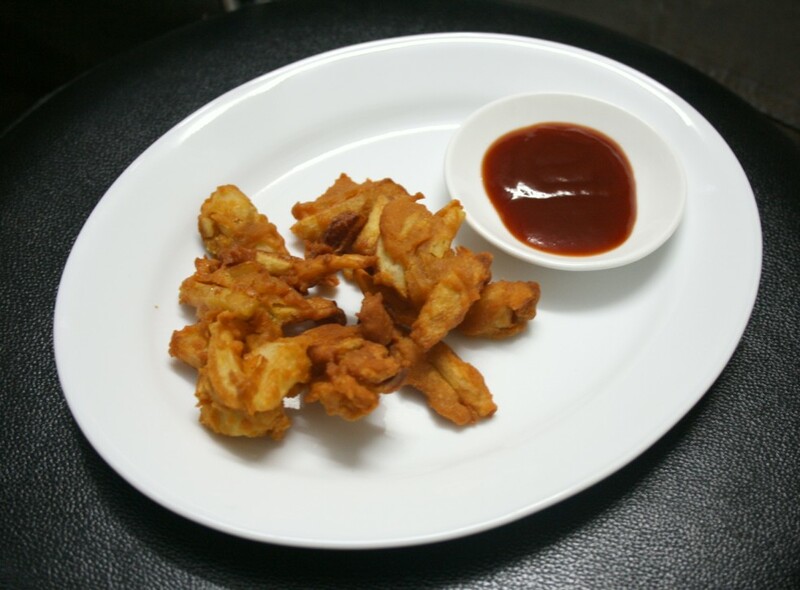 Allo pakodas are my all time favs…luv these crispy darlings with tomato kethcup..yum! Again learning another new recipe from you :)! Love these crispy fries like fritters. What's not to like in them, potato, besan, spices , and deep fried. I don't care if it rains but can have it any weather. Never tried this version of aloo pakora. They look absolutely delicious…. Those pakodas look crunchy and delicious. 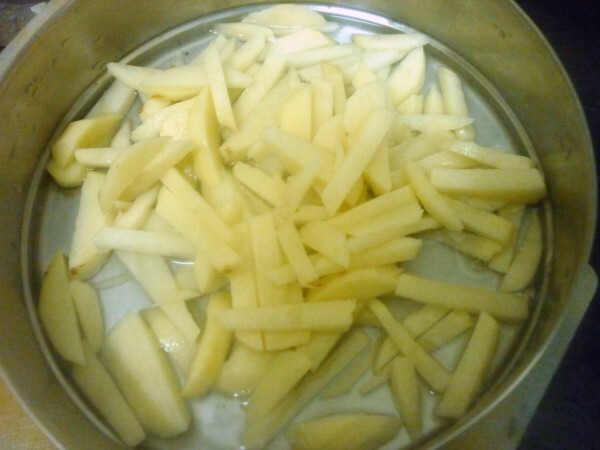 Different way of making aloo pakodas.